Lovely quiet apartment minutes from the historic Old Town. Located centrally and bordering the famous Planty park, the appartment is just five minutes' walk from the historic market square with restaurants, cafes and the best Kraków has to offer. Situated on the third floor of an established mansion block, the apartment is arranged over two stories and consists of a lounge and an open kitchen, with WC and walk-in wardrobe. On the upper level there are two bedrooms - one with a double bed the other with two single beds - and a bathroom. The lounge contains a double sofa bed. The flat is spacious and light, with plenty of storage and all the equipment necessary for a comfortable and relaxing stay. The building is located in a quiet cul-de-sac with a selection of convenience stores nearby. Part of its charm is that its location ensures you have the benefit of being very close to the market square - a UNESCO World Heritage Site - yet are insulated from the usual city noises. 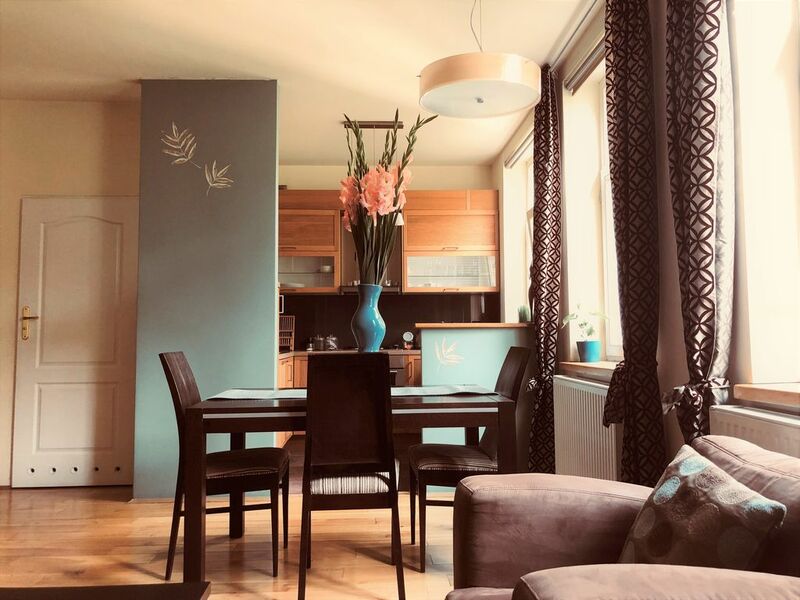 There's something for everyone in Kraków, whatever time of year you choose to visit, and this apartment is ideally located to use as a base to take advantage of all of the city's many attractions. All of this historic city's central landmarks - such as the Wawel Castle or Kazimierz district - can be reached on foot. If you wish to explore further - for example, the Nowa Huta suburb - then a tram stop is just a three-minute walk from the apartment. The family-owned apartment is located a short taxi ride (or a pleasant 15-minute walk) from the main rail station that connects via a fast shuttle service to Kraków Airport. Buses and trains also depart from the station for the sites and attractions that lay outside of the city. We are an Anglo/Polish family, and divide our time between Kraków and London. The term 'location, location, location' has never been more appropriate! Once you've dropped off your bags and stepped outside to explore for the first time, you'll be amazed how close you are to everything. Perfect, Nice and clean apartment. Lovely apartment just 5 mins walk from the old town. Spacious open plan layout, nicely decorated and well equipped with everything you need. We travelled with a 2 year old and having the space to roam was really good for her. Only minor downside was no WiFi but as we were there for just a few days to see family it was not an issue for us. Being so close to the old town and all its highlights, restaurants and the Christmas market was fantastic and we really enjoyed our Krakow holiday. Would stay here again! Location, comfort, size and style and perfectly clean, and that is just to start. The apartment was in a great location to the old town without being on a busy street, (ie very quiet). The young man who met us,(I am sorry I forgot his name) was a perfect gentlaman and directed, no walked us (out of his way) to a beautiful restraunt. I cannot thank you enough for allowing us to stay in your apartment. As to the question of a recommendation, absolutely with out any hesitation..
We LOVED the apartment. So pleasant. Lovely apartment. Trees right outside the window. Great location. Short walk to main square through lovely park. This apartment is exactly as described! The lack of wifi wasn't a problem as there are plenty of places nearby with free wifi available. The beds were very comfortable and had good air flow thanks to the many windows throughout the place. Water pressure and temperature was good though the water seemed to collect on the rim of the tub. There were many extra towels and blankets provided and didn't really have to contact the host except to give back the keys. Thought the stairs would be harder than they were, its a very wide stair case to get to the apartment and not very steep. Would definitely stay there again! Thanks Bożena, Peter and Marta!